Latina faculty are rarely visible in this way. Only 4 percent of tenured or tenure-track female faculty members in the United States are Latina (78 percent are white, 7 percent are African American, and 7 percent are Asian American), and only 3 percent of female full professors are Latina. The gathering of Latina faculty at Ferrier’s inauguration illustrated the potential for a critical mass of Latinas to come together in one place to support one another in the academy. Dressed in full academic regalia, they represented the possibility of access to privileged positions in the professoriate. Indeed, some wide-eyed passersby who saw them lining up in the procession asked, “So, are you all really professors?” They were proof that Latinas, and Latinos more generally, can and do make it to the academy, despite their generally limited access to higher education opportunities, particularly baccalaureate and postbaccalaureate degrees. Although Latino enrollment in higher education has increased as the US Latino population has grown (Latinos now outnumber African Americans), more often than not Latinos begin their college education in community colleges or less selective four-year institutions—institutional types with lower persistence and completion rates in general. Moreover, the broader political, economic, and social climate in the United States has become increasingly hostile for Latinos as new policies opposed to immigrant rights, affirmative action, and ethnic studies programs have emerged. After the Arizona legislature passed a law (currently being challenged by the federal government) to broaden the capacity of state personnel to detain and request identification from any person perceived to be an illegal immigrant, several more states, including Alabama, launched initiatives to increase surveillance of immigrants and deny them public services, including K–12 and higher education. Affirmative action policies have been banned in some key states where Latinos are concentrated, leading to drops in application and enrollment rates at flagship and selective public universities. Even when they are accepted to a university, Latinos are often denied opportunities to connect with their cultural backgrounds and to communicate in Spanish. Ethnic studies programs and courses, including Chicano studies, sometimes struggle for support and legitimacy. Arizona’s legislature has gone so far as to ban the teaching of ethnic studies in K–12 schools. 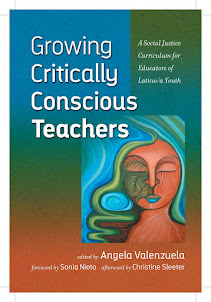 This challenge to ethnic studies has been particularly targeted at Chicano studies, despite evidence that Latino students who participate in these programs actually have higher educational achievement than those who do not and high school graduation rates on par with those of their white counterparts. UT History Professor Emilio Zamora, has a great piece that just got published in Somos en escrito: The Latino literary online magazine (August 7, 2013). 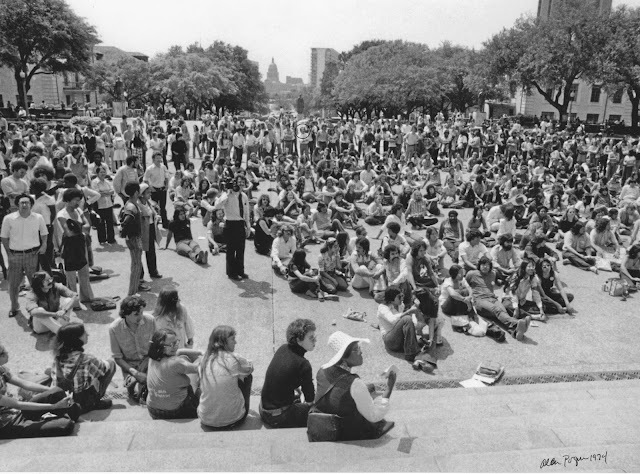 He appears with so many others below in one demonstration in support of Chicano/a students that had taken over the president's office in 1974. The photo was taken by social movement photographer Alan Pogue. Based on an address May 18, 2013 by Professor Emilio Zamora as part of a symposium at the University of Texas at Austin highlighting the importance of the Mexican American Library Program (MALP) in collecting, preserving, and making available archival knowledge over four decades. The MALP began with the formation of the Mexican American Graduate Association (MAGA) in 1972. Approximately ten Mexican American graduate students, mostly from the College of Liberal Arts formed MAGA and joined with the Mexican American Youth Organization (MAYO) and community organizations to support the Center for Mexican American Studies (CMAS), established in 1971. The community that coalesced around CMAS expressed concern that the university had not established the necessary institutional support to increase the presence of Mexicans at all levels of university life and to advance the study of the Mexican community. The establishment of CMAS was a step in the right direction. It became the focal point of evolving ideas, responsibilities, and opportunities in Mexican American studies. Its academic program, for instance, offered undergraduates formal learning environments and academic specializations, as well as opportunities for graduate students to teach research-based courses. A 2010 report by the UCLA-based Civil Rights Project, "Choice without Equity: Charter School Segregation and the Need for Civil Rights Standards," uncovers some troublesome facts in this regard. "While segregation for blacks among all public schools has been increasing for nearly two decades, black students in charter schools are far more likely than their traditional public school counterparts to be educated in intensely segregated settings. At the national level, 70 percent of black charter school students attend intensely segregated minority charter schools (which enroll 90-100 percent of students from under-represented minority backgrounds), or twice as many as the share of intensely segregated black students in traditional public schools." As a parent I find it easy to understand the appeal of charter schools, especially for parents and students who feel that traditional public schools have failed them. As a historical sociologist who studies race and politics, however, I am disturbed both by the significant challenges that plague the contemporary charter school movement, and by the ugly history of segregationist tactics that link past educational practices to the troubling present. The now-popular idea of offering public education dollars to private entrepreneurs has historical roots in white resistance to school desegregation after Brown v. Board of Education (1954). The desired outcome was few or, better yet, no black students in white schools. In Prince Edward County, Virginia, one of the five cases decided in Brown, segregationist whites sought to outwit integration by directing taxpayer funds to segregated private schools. It’s 1991 and the New York Giants win the Super Bowl 20-19 after a missed Buffalo Bills field goal. Seinfeld debuted on TV, "Dances with Wolves" won Best Picture, and the U.S. minimum wage goes from $3.80 to $4.25 per hour. Gas prices average $1.12, a new house will cost you $120,000, and the average person makes around $29,430 per year. That was also the year the state of Texas updated its Cost of Education Index (CEI). Today, gas averages $3.36, the New York Giants have won two more Super Bowls, and minimum wage is $7.25. The average home will cost you $152,000, Seinfeld has been off the air for 15 years and now rules syndication, the average salary in the United States is $46,326 and Kevin Costner hasn’t made a decent movie since (unless you actually liked Waterworld). Yet the state of Texas still uses the same Cost of Education Index that was developed in 1991.The CEI is the complicated formula system that Texas uses as a basis to distribute education funding to the 1,024 school districts. That’s right – the education of Texas’ students is based on a 24-year old funding formula. The students taught in Texas schools were not even born when the CEI was last updated. Aside from the obvious changes in costs that come over more than two decades, a lot has also changed in Texas schools since 1991. There were 3,378,318 students enrolled in public schools in 1990-91. Today there are 4,978,120. A 47.35% increase. In 1989, 24.3% of Texas children were living in poverty. In 2011, that number has risen to 30%. As late as 1994, 46% of Texas students were on free or reduced lunch; that increased to 60.4% in 2011. Students enrolled in bilingual/ESL programs have increased from 9.7% in 1992 to 16.2% in 2011. Critics say Teach for America has strayed from a core mission of helping needy urban schools, favoring efforts seen as anti-teacher union. Over its 24-year history, Teach for America has won accolades for taking top college graduates and putting them to work in some of America's toughest schools, creating what it regards as a national model of nonpartisan service in education. But some former participants and academics, among others, have recently accused the Peace Corps-like organization of taking sides in the education policy wars. They criticize the nonprofit for aligning too closely with its largest private donors and high-profile alumni who have gone into politics. They say the group has diverged too far from a core mission: addressing a teacher shortage with top college grads primed to inject energy and success into low-income, urban campuses. The key backers of Teach for America include foundations that support efforts to expand charter schools, limit teacher job protections, weaken union clout and evaluate instructors by using student test scores. The Walton Family Foundation, for example, last week donated $20 million that will help fund about 500 hires in Los Angeles. Funded by the family that began Walmart, the foundation supports both charter schools and government vouchers to subsidize private school tuition for low-income families. One of their most significant achievements has been to preserve Latino literature, and make it a living part of our nation’s cultural narrative. They have gone directly to the creators of the literature and devised ways for all of us to better understand, appreciate and enjoy who we are as Latinos and Americans. What's amazing about this piece is that it lays out how it really is the tireless advocacy and organizing of the few that has helped build the corpus of Latino/a literature that we do have—and despite significant uphill battles. In short, this is intensely political work at the same time that it is undeniably a labor of love. American libraries whether they are public, academic, or specialized collect and organize data and information on a broad range of topics and interests. With respect to literature, especially writings that focus on America and its people, their holdings reinforce the interests and priorities set by the library’s policy makers. 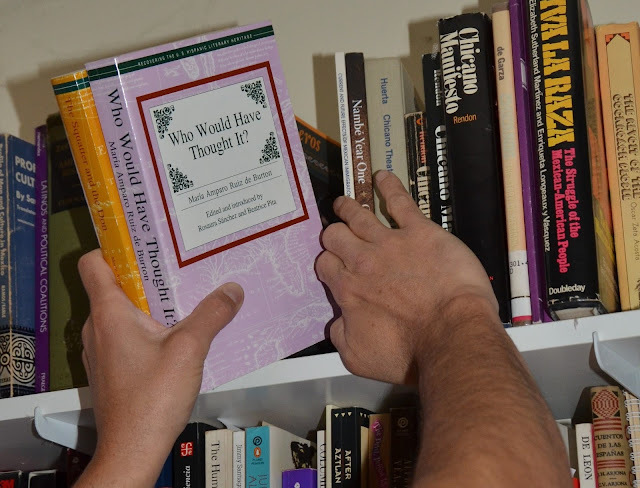 However, it has been a bitter experience over the years that the writings by and about people of color were not systematically purchased, cataloged and preserved by many types of libraries. The Civil Rights movement in the 1950s triggered an important transformation. Scholars, informed laymen, and other readers began to ask librarians to identify literature about the unique experience of people of color, focusing mainly on blacks, and gradually other minority groups in America and soon black writers, poets and essayists were “discovered and re-discovered,” and became popular. But there were challenges to black literature, as books like Soul on Ice (1968) by Eldridge Cleaver, The Autobiography of Malcom X (Grove Press: 1968), and even the classic work The Fire Next Time (Dial Press: 1963) by James Baldwin were considered subversive and un-American by conservatives until the American public decided they wanted to read them. Literary accounts of Latinos in America were not as easy to capture as black writings. Numerous factors complicated the identification of literature about the Latino experience in this country. Latinos are a heterogeneous group in our population that includes Hispanos in New Mexico settling there before Northern Europeans established permanent settlements along the Atlantic Seaboard. Other Latino groups, particularly people of Mexican origin, lived in the territory in the Southwest conquered by the US after the Mexican-American War (1846-1848).